In 2006 the Elders of Charlotte Avenue and West Nashville Heights Churches of Christ began talks of merging the two congregations. Discussions continued until both congregations agreed to formally merge and create one congregation. The merger became official in November of 2007. The new name of Charlotte Heights Church of Christ was selected, a combination from the names of the two previous congregations. It was also agreed that the new congregation would meet temporarily in the West Nashville Heights building until a new facility was constructed. In 2007 both properties, Charlotte Avenue at 4508 Charlotte Pike and West Nashville Heights at 5807 Charlotte Pike, were placed on the market for sell. The Charlotte Avenue property was put under contract immediately with a sale to finalize in late 2007. At that time four lots with houses were purchased by the church at the intersection of Templeton Drive and Old Charlotte Pike. Three of the houses were removed in anticipation of immediately beginning construction of the new church building. The fourth house was preserved as a house for our yet to be hired Youth Minister. The sale of the Charlotte Avenue property fell through and the properties remained on sell for several years with minimal interest. 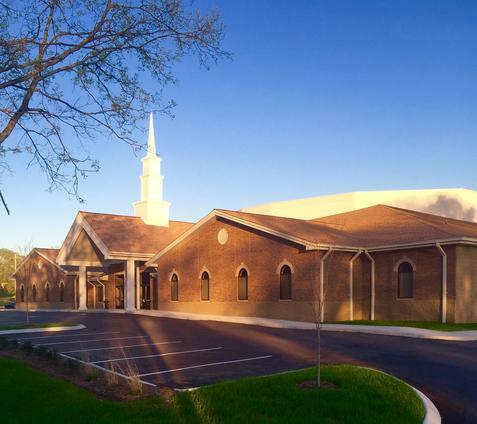 Over the course of the first 5 years, the congregation struggled financially with the reduction in real estate values due to declining nationwide economic conditions and the construction of the new building continued to be put on hold. The Charlotte Avenue building was eventually demolished and the site offered for sale. In 2012, the Charlotte Ave property was sold and in May of 2014 the ground breaking ceremony was held at the new site on Old Charlotte Pike and construction began on the new facility. Charlotte Heights Church of Christ had its final worship service in the old West Nashville Heights building in November of 2015. The first service at the new facility was held on November 22, 2015, eight years to the month from the merger. After moving into our new facility and continuing to settle in our official Grand Opening service/ceremony was held on March 6, 2016. After many prayers and with Gods help the dream was realized. During the brief time in our new facility we have hosted several events such as Ladies Day, Nashville Christian School events and a legal issues facing the church seminar. In 2015, Davis Webb and Steve Bishop were appointed as elders and Brother Don Wood resigned as an elder due to health reasons. Brother Frank Mayo, who had served as an elder for over 50 years at Charlotte Avenue and Charlotte Heights, passed away in September 2016. Brother Clifford Dobbs resigned as an elder and minister in 2018 after having served as a minister for West Nashville Heights and Charlotte Heights for many years as well as an elder for Charlotte Heights. Of the original elders, Hal Bishop, Frank Mayo, Melvin Ryan and Don Wood are now deceased while Oscar Carver and Wendall Talley resigned for personal reasons. Billy Webb also served as an elder for a period of time. Larry Hime continues to serve as an elder. Jim Morgan served as minister until 2013. Clifford Dobbs served as Involvement Minister from 2010 through 2018. Kory Crow was hired as youth minister in 2011 and serves today as Youth and Family Minister. In 2018, Darrell Blankenship resigned as the minister and Josh Barnett was hired and began serving the congregation in September 2018. You can find more information regarding our congregation within our website but please come visit us to get to know our leaders and members.